OrangeTrips Holidays is the largest integrated Travel and Travel related Services Company in the country offering a broad spectrum of services that include Corporate Travel, Leisure Travel and Study trips. It was founded in 1999 and it is celebrating its 8+ years of world class service with dedicating itself in knitting the world in field of tourism. 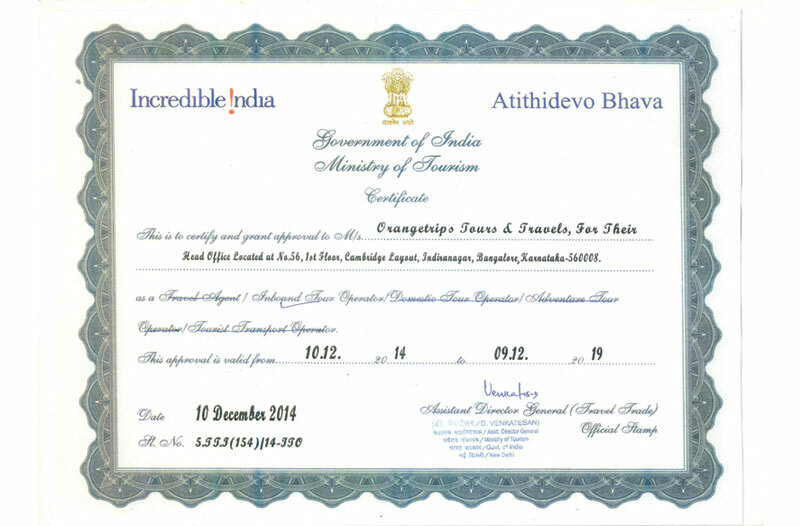 We are very much proud that "OrangeTrips Holidays is First ISO 9001:2008 Quality Certified Travel Company in India"
OrangeTrips is approved by Ministry of Tourism, Govt of India. 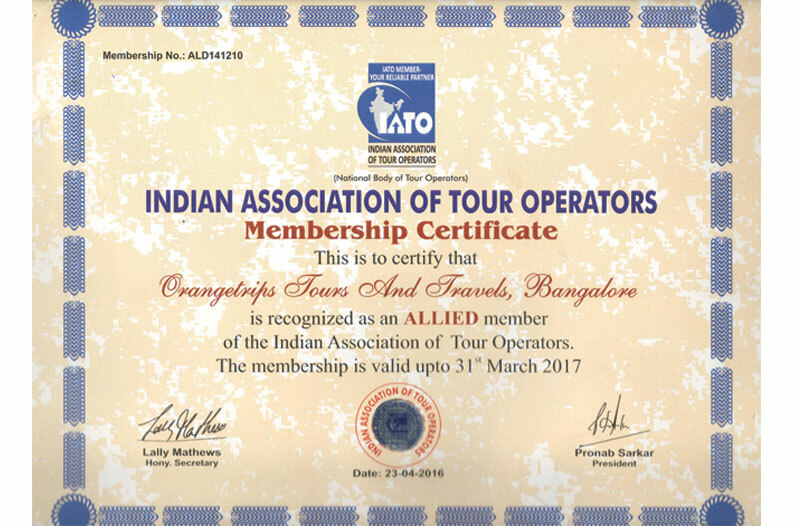 Though there are 30,000+ Travel companies in india, Only 300 companies are approved by government and we are one of out the 300 companies approved by Indian Tourism government OrangeTrips is a member of multiple associations such as India Association of Travel Agents, Travel Agents Federation of India & etc. We are Awarded & Recognised by various Government and Travel trade institutions. To offer a world class holiday experience to our customers, We always choose our partners are certified by various excellence awards. Few of the awards are as below but this is not the complete list. At OrangeTrips, We strongly believe that our customer travels to any destination once in a life time and its our responsibility to create once in a life time memorable experience. So far, there are more than 4 Lacs customers travelled with OrangeTrips and in which more than 70% customers are repeated & referral customers. OrangeTrips is supported by a strong partner network of 5800 Travel Agents in 100+ cities pan India & 1200+ travel agents outside india. As a global player we exhibit in all the major travel events happen around the world such as WTM-London, ITB-Berlin, SATTE-New Delhi, OTM-Mumbai, TTF-Bangalore-Mumbai-Delhi-Chennai-Cohin, IITM-Bangalore-Chennai-Mumbai-Delhi-Hyderabad. OrangeTrips is approved by Ministry of Tourism – Govt. 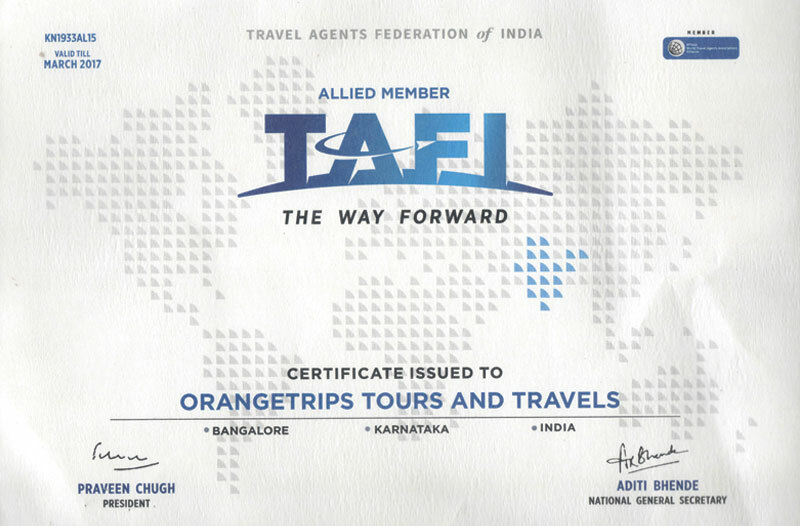 of India and part of many travel associations such as TAFI, IATO & etc. OrangeTrips has exhibited in various Tourism Exhibitions and following are few of them. No.80/1, 2nd floor, New Thippasandra Main Road, HAL Stage 3, Indira Nagar, Bangalore.